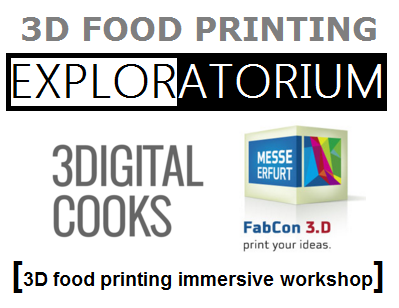 We are happy, glad, hyped and excited to announce that our next 3D food printing workshop will happen at Fabcon 3.D 2016. 14-16 June at Messe Erfurt in Erfurt, Germany. Huge thanks to Florian Horsch, Marcus Lutterburg and Diana Kuecher and the whole Messe Erfurt team for their selfless efforts to bring our workshop to FabCON 3.D. 2016! Unless you are new to the 3DIGITALCOOKS community you know we have been planning to have a 3D food printing workshop for a long time, and it feels right to share with you all the experiences and learning about 3d food printing during the last years. We have created a 3D food printing workshop that requires no previous knowledge or understanding of what 3d food printing is. During the 3[d] hours of the course you will get an understanding of the importance of 3d food printing beyond the Star Trek hype. A down to earth EXPLORATORIUM time to learn about 3d food printing. Be aware that this is not a POWERPOINT session. The 3d food printing workshop is about learning through experience. Right from the very beginning each concept, each lesson is presented through food. Why food? Because food is what truly makes 3d food printing amazing and so special. No gimmicks. A clear introduction to how to turn a digital design into an edible item. Definition of a digital recipe. Understanding of the true potential of design and customization for 3D food printing. Explaining the four kings of 3d food printing: taste, aroma, texture and looks. Introducing different 3D food printing techniques. Addressing safety and legal issues. Our take on 3d food printing businesses. All that in an open and immersive environment where we will be answering your doubts about 3d food printing. Each session is limited to 10 students, and registration is first come first serve. If you are considering to come, remember that 3d food printing is about food and food is emotion. Huge shoutout to the FabCon team and the 3DC community, we appreciate your support more than you even know! We are extremely excited for this 3D food printing workshop and can not wait for it.